In these days of massively accelerated culture it’s easy to forget yesterday’s obsessions. The cultural landscape seems to be eternally sixteen years old; a year lasts a minute, a kiss the eternity of the blink of an eye. Of course maybe it’s always been this way and it’s only the on-going writing and re-writing of the historical document that makes it seem ever more fluid and transitory. Like it took a character in an Ed McBain 87th Precinct novel to really make me realise that the time scale of the Beatles rise was so incredibly short. Five years from eruption to disintegration, something like that. In the USA at least. Which seems so weird because in so many ways they’ve been around for forty. They never went away, not even when The Clash sang about how there would be no Beatles or Rolling Stones in 1977. But yesterday’s obsessions. Jonathan Donaldson recently mentioned how difficult it is to keep with what’s all coming out, particularly when you are someone who is as he says ‘a seeker’. The other thing he could have said is that it’s also hard to keep up with old favourites. Sometimes even new favourites. All of which is a roundabout way of saying how much the Hidden Cameras had slipped from my mind. Of course it’s only a year since the glories of Joel Gibb and his roustabout troupe of musicians waltzed into my heart with the wild gay abandon of their ‘Ban Marriage’ single, but a year is a long time, and it’s been mighty quiet on the Camera front since their Smell Of Our Own debut rightly won hearts and minds around the globe. With the band currently putting the finishing touches to their second album, Rough Trade politely remind of us of their genius with the release of the mythic CBC Sessions on a limited edition 10” on April 5th. Mark that date in your diaries now, kids, because this is one record you truly need, regardless of whether you are already in possession of one of those CDR things that helpful fans burned for you last year, or a tape that you recorded from the downloaded stream off the CBC website. Six cuts of magic, a reminder once again of what made this group such a hot topic in their native Toronto and beyond, of the sweet soaring harmonies and melodies that haunted your reverie for days on end and that are now destined to do so all over again. If there’s one complaint it’s that the lack of between song banter and the squeaky clean sound means that some of the essential warmth of the Hidden Cameras is lost, but that’s picking tiny holes of annoyance; the petty meanderings of someone who just wants to say ‘oh yeah, well, I remember when…’. All of which is essential to the Pop experience of course, but whatever. The bottom line is you need to buy this record, and you need to once again proclaim from the heights that The Hidden Cameras are God. Also on Rough Trade is a new offering from sufjan Stevens. sufjan steps sideways from his 50 album plan (to make one based on each American State) and gives us Seven Swans, an album of deliciously downbeat Folk that sounds just fine thank you very much. Roping in Danielson Family members for the sessions (Family ringleader Daniel Smith was in charge of knob-twiddling on the sessions), sufjan makes a sound that resonates, like those early Elliott Smith albums, with the essence of traditional Folk but that remains tinged with contemporary airs. There’s all kinds of inspirations in the melting pot here; William Blake, Flannery O’Connor, Old Testament fire and brimstone, psych fantasy, all pulled down into a round the campfire banjo and guitar sing-a-long, where the songs are whispered to the moon and the trees in spooked reverence of their powers. On a different tack entirely are The Diskettes. Hailing out of Victoria, British Columbia, this duo recall nothing so much as an early Beat Happening, which of course is really saying something. I can still remember the day I bought that first Beat Happening album, dropping in at A1 on the way to the station… that bright yellow sleeve, those songs of brittle magic reverberating with a heartbeat like the Marine Girls. And of course just days earlier I had drawn a picture of Calvin and Jen in my sketchbook as I started back in Art School, although the drawing now seems to have been misplaced, which is sad and another story entirely of course. So the Diskettes make me think of these things, make me think how much this kind of kick back and take it back to the core Pop approach is so amazingly evocative and magical. A wonderfully mad blend of Having A Party Jonathan Richman, bossa nova, doo-wop, lounge and DIY Punk aesthetic, The Diskettes make music for beach parties and picnics. The essential sound of summer 2004 is already with us. Now all we need is the sunshine. Oh, and to get through Spring. Still, lets say it again, ‘anticipation is so much better’. 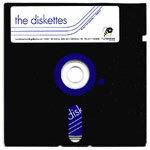 And did I mention that The Diskettes do a couple of drop-dead cool covers? There’s The Bobbettes’ ‘Mr Lee’, and the old Frankie Lymon and the Teenagers’ classic ‘ABC’s Of Love’. Such poise, such style, sadly overlooked whilst everyone else still frantically tries to recreate the early ‘80s. Oh well. The Loves sound like they have scoured the same sources as Bearsuit, but personally I have more time for their Love debut (Track and Field) than for Cat Spectacular. Why is this? Maybe it’s just because of the silly nod to Dylan on the back cover photo, and the fact that the Loves look like the gang of ultra-hip Pop kids I always wanted to hang with. There’s more of a pure ’60s shimmy to the Loves too, which I obviously find endearing, and plus they have the good sense to nod to Vic Godard and the Subway Sect which is always going to win points around these parts. The Loves then sound like a band madly trying to piece together their own identity, and having a huge amount of fun in the process. Because of this Love sounds at times unhinged, like someone lifted the top of their collected heads and let the contents spill out, so that here they sound just like the Pastels when they were making songs for children; there they sound like Talulah Gosh with their beatnik boys; over on that one they’re doing ‘Vertical Integration’… Seldom does the blend come together to make you think ‘oh yeah, THAT’S the sound of The Loves’, but then again, so what? 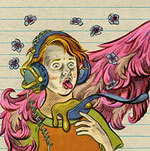 So, postmodern to the point of perfection, or confused meanderers in the puddle of (indie)Pop? Today I’m plumping for the former.